Morgan and Horford quietly play post defense, grab loose balls, pull down rebounds and hit baskets when the opponent gets too focused on stopping the 3-pointer. 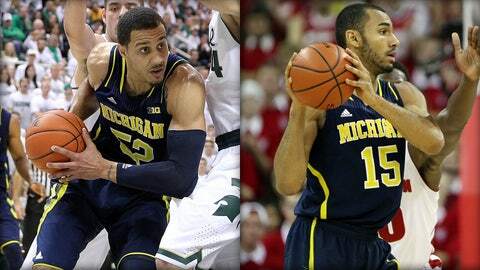 Jordan Morgan and Jon Horford are turning into the forgotten heroes of Michigan’s improbable season. A year ago, the duo had regular spots in John Beilein’s rotation, but Mitch McGary’s emergence as a national star in the NCAA tournament sent them back into the shadows. It didn’t seem likely that would change this season, especially after McGary was named a First Team preseason AP All-American. They got some extra work in fall camp and the preseason, as McGary recovered from a back injury, but once he returned early in the non-conference season, it appeared that Horford and Morgan would be battling for a few minutes each game as McGary’s backup. McGary’s back, though, didn’t even make it to the beginning of Big Ten play, and he’s now watching the Wolverines play from the bench, dressed in a suit and tie. Suddenly, Michigan needed its two veteran big men — the only two upperclassmen on the roster — and needed them badly. Beilein couldn’t expect them to run the floor like McGary did in last season’s tournament run, but he couldn’t let the center position turn into a weakness — not on a team that was already replacing Trey Burke and Tim Hardaway Jr.
He’s gotten more than he expected. When you beat three top-10 teams in a week, people tend to take notice. Morgan and Horford haven’t been spectacular. They don’t bomb 3-pointers like Nik Stauskas or Caris LeVert, and they don’t end up as part of highlight-reel alley-oops like the ones Derrick Walton Jr. and Spike Albrecht throw to Glenn Robinsin III. They just quietly play post defense, grab loose balls, pull down rebounds and hit baskets when the opponent gets too focused on stopping the 3-pointer. In Michigan’s first Big Ten game, a win over Minnesota, the pair put up 17 points and 11 rebounds in 39 minutes. Since then, the duo known as "Morford" has just kept quietly giving the Wolverines a 40-minute double-double almost every night, giving Beilein more than enough production to let the rest of the team play its game. They had 15 points and 16 rebounds against Northwestern, and scored 17 in a one-point win over Nebraska. They barely missed another double-double in a comfortable win over Penn State, leading into the toughest part of Michigan’s schedule — three straight games against top-10 teams, two of them on the road. First up, a trip to the Kohl Center, where No. 3 Wisconsin rarely loses a game. Michigan pulled off the 77-70 upset, aided in great part by Morford’s 12 points and 15 rebounds. Back home to the Crisler Center to face No. 10 Iowa. Another double-double from the center position, and a 75-67 victory. The biggest test was still to come. On a cold, snowy Saturday, the Wolverines made the short bus ride to East Lansing and a date with No. 3 Michigan State. The Spartans were banged up inside, missing Adreian Payne and Branden Dawson, but they still had Gary Harris and, more importantly, Tom Izzo. Michigan State’s Hall of Fame coach made up for his missing players by running wave after wave of lineups at Michigan. One moment, he would have a huge lineup, populated by post players from the end of his bench, and the next he would be playing three guards and a small forward. The strategy worked for the first half, and it created a crack in the armor of Michigan’s post duo. Morgan spent most of the game in foul trouble, and when Horford had to join him on the bench for the same reason, Beilein had to give four crucial minutes to little-used Max Bielfeldt. The sophomore didn’t do much — he didn’t have any statistics at all other than calmly grabbing two defensive rebounds — but he bought enough time so that Morgan and Horford could finish the game. Did it work? Well, on a night when Stauskas, LeVert and Walton put up 55 points, Michigan didn’t need a lot from their centers, but it got 10 points, and thanks to Bielfeldt, 10 rebounds. For the first time in decades, the Wolverines had gone into East Lansing and knocked off a top-5 Spartans team. After the game, Beilein raved about Morgan’s leadership. He’s the team’s only senior — he’s working on a master’s degree, having already finished his bachelor’s — and he had been to the Breslin Center for the win in 2011 and for some ugly losses in between. "Jordan has been knocked down in this building, and he’s been punched in the mouth in this building, but he also had won a game here," Beilein said. "He got knocked down a time or two today, but he bounced right back up, and his teammates saw that. That meant something to them." Horford was on that 2011 team as well — the pair weren’t quite as effective as freshmen, combining for six points and three rebounds in that win — and between the pair, they had just enough local knowledge and leadership to keep their young teammates from falling apart when Michigan State threatened to pull away. "We knew this was going to be a battle," Morgan said. "It is never going to be easy to win a game in this building." Morgan and Horford will walk away from their careers with two wins at the Breslin Center, something not many other Wolverines can say. There’s still more to accomplish though — a second Big Ten title? A second Final Four? Or, if they keep filling the gap while their young teammates grow around them, maybe even a first national title.